Empty Bowls Hunger Awareness Dinner at the Cox Business Center serves as a gathering of Food Bank friends and supporters for a dinner, live and silent auction, raffle and live entertainment. Honorary Chairs Leslie Paris and Ken Ray Underwood invite guests to take home a keepsake bowl made by local artists, which serves as a reminder of the many empty bowls in Oklahoma. 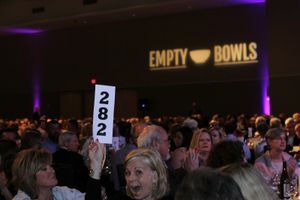 Last year Empty Bowls provided the equivalent of over 2.6 million meals last year to hungry Oklahomans.